Which Page Format should choose to make perfect flipping book? People use flip software to create magazine, brochure, album and also gallery. Some of the books are based on only words, and some of them are mainly consisted of beautiful pictures. In general, an outstanding flip magazine will contain rich contents including words, images and multimedia objects. To meet different needs, we provide render engines of pages to make sure that flip pages will show perfectly after importing, even thought our software will help to maintain the original page contents. There are two Page Formats for you to choose from in the FlipBook Creator Standard for Mac v1.3.5 and FlipBook Creator Pro for Mac. They are SWF Format and JPG Format. Step2: find the Page Format tab in the right middle side and choose the suitable one for your flip book. 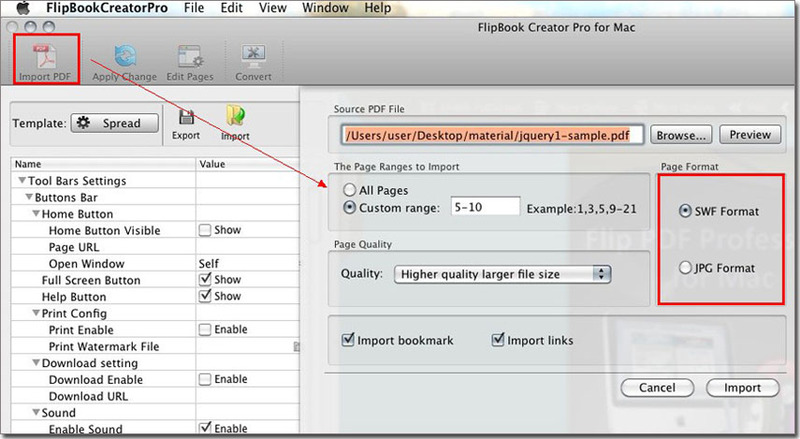 Then you can import a PDF file and apply the page format you have chosen to it. Obviously, when you want to make pages more legible, choose SWF Format. When you need a higher page color, choose JPG Format.